Mutations found in Presenilin genes (PSEN1 & PSEN2) can be accounted for the majority of the early onset FAD mutations. Presenilin FAD mutations have been shown to alter calcium signaling. Recently, studies show that Presenilin itself can be a ‘leak’ channel on the ER that depletes Ca2+ ions from the smooth ER. This discovery led us to investigate the possible crosstalk between Presenilin and intracellular calcium signaling, as it relates to TrpC5 channel activation. TrpC5 is a multi-pass membrane protein and is thought to form a receptor-activated non-selective calcium permeant cation channel. Previous research conducted by recent graduate Sukhjinder Kaur and Dr. Buraei investigated the effects of Presenilin on TrpC5 Channel function. A result of the experiment found that that co-expression of WT Presenilin resulted in a significant decrease in agonist-evoked TrpC5 channel currents. A plausible explanation is that Presenilin expression renders the ER somewhat Ca2+-poor, and subsequent Ca2+ efflux through IP3 receptors -required for TrpC5 activation is significantly diminished. They also tested the effect of FAD mutant Presenilin M146V on TrpC5 channel activity, finding that that Pres-WT decreases TRPC5 currents, whereas, Pres-M146V does not inhibit TrpC5 as effectively. This may have a significant impact in the pathogenesis of Alzheimer’s disease, especially when Presenilin1 is mutated. Presenilin FAD mutation D257A, a mutation that is known to abolish γ-secretase activity, does not seem to impact the function of presenilin as an ER leak channel. 1) We will use mutant Pres-M146V and wild-type presenilin to confirm the previous studies. 2) We will synthesize Presenilin FAD mutation D257A. 3) We will perform electrophysiological studies (using two-electrode voltage clamp) to compare the functions of wild-type and mutant channels. At least 10 oocytes for each condition will be required if we are to draw sound conclusions following data analysis. 4) We will analyze the data to draw conclusions. 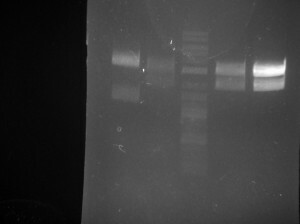 In order to carry out our experiments, we will utilize cloning techniques, minipreps, RNA synthesis, and gel electrophoresis. I hope to update you soon with progress photos! 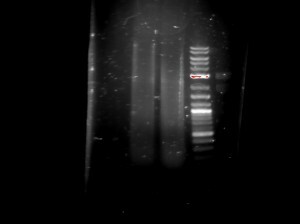 So far I have had a lot of success obtaining highly concentrated DNA containing my Presenilin D275A mutant. In order to do this,I have produced and utilized competent cells to propagate the abundance of DNA. Then, through lysing the cells and “collecting” the DNA, I am able to obtain a high concentration of my target DNA that will be used to synthesize RNA. I can’t wait to continue my research begin RNA synthesis soon! Updates to come! The past few months have been amazing. After all of my time in the lab, I am now confident in my ability as a student researcher to not only execute experiments via following procedures but also reflect and troubleshoot challenges I have faced along the way. Although it may be difficult to see, the right most column contains 2 white bands. Using the ladder to the left (which provides a ruler by which we can determine the amount of base pairs in DNA) we determined that the two bands coincide with the mathematically expected band sizes. Thus, our mutant DNA does contain the desired sequence, and is not the problem. Currently, I am conducting experiments including various times and temperatures to troubleshoot my RNA synthesis experiment, hopefully in the next blog I can show you all a picture containing my RNA bands!